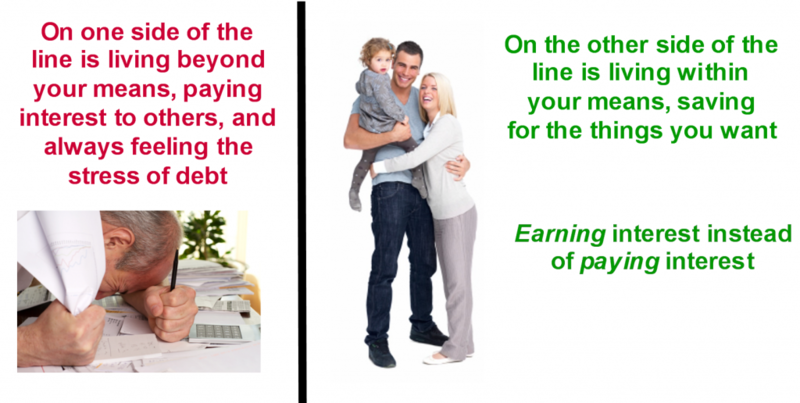 What side of the debt line are you on? A couple months ago, I interviewed Dan Proskauer. Dan lives below his means and has significant savings discipline. But after decades of saving and investing and “doing all the right things” we’ve been taught to do, he realized he had nothing to show for it. Dan is a vice president of technology engineering, very analytical, and he has spent hundreds of hours investigating . His conclusion? “The more I look into Bank On Yourself, the better it looks,” says Dan. And he has implemented it for his family in a big way. Dan shared the findings and conclusions of his research in a fast-paced interview. I encourage you to check it out now, if you haven’t already done so. But what if you’re in debt? Maybe you can relate to Dan’s friend’s situation. It’s a seemingly endless cycle of living beyond your means, using high-cost borrowing, which means you have interest to pay – leaving that much less for everything else. It’s part of “Parkinson’s Law.” He also said that, “a luxury, once enjoyed, becomes a necessity.” I can definitely relate to that, can’t you? What side of the “line” are you on now? If you’re on the “wrong” side of the line, you know it. You’ve probably tried to get to the other side of the line, but it’s not an easy journey to make. The good news is that if you’re truly fed up with your situation and ready to make a change, Bank On Yourself can help you get there. My New York Times best-selling book, is filled with stories of folks of all ages and incomes who have done just that. You can also download a transcript of the interview here. And, if you’d like to get a no-obligation Analysis and a referral to a knowledgeable Bank On Yourself Authorized Advisor like the one Rose got referred to, who can show you how much your financial picture could improve if you added Bank On Yourself to your financial plan, simply request a free Analysis here. Most financial experts say that the way to avoid getting into debt is to save up and pay cash for things. They are wrong! There is actually a better way to purchase things. I call it the “better than debt-free” method, and it actually beats paying cash. What do I mean by that? Let’s say you’ve decided you’re going to beat the financing and leasing rackets by paying cash for major purchases. So you start putting money aside into a savings or money market account. When you hit your savings target, you pull your money out to pay cash for that item. Now how much interest are you earning on that money? You’re earning ZERO interest, of course. Which is why financing, leasing and paying cash are all losing scenarios. Fact: You’re either going to pay interest to others to finance things, or you’re going to lose the interest or investment income you could have earned, had you kept your money invested instead. When you Bank On Yourself, you do pay interest on your policy loans. But the interest you pay ends up in your policy, as I explain in detail on pages 100-102 of my book. Bonus: Some companies have a feature that allows you to continue to earn the exact same interest and dividends – even on the money you’ve borrowed! However, only a handful of companies offer a dividend-paying whole life policy that meets all the requirements to maximize the power of this concept AND pay you the same interest and dividends, regardless of whether you’ve borrowed from your policy . And if your policy isn’t structured properly, your cash value won’t grow nearly as fast, you could lose the tax advantages, or both. When you request a free Analysis, you’ll get a referral to one of only 200 financial advisors in the country who have met all the rigorous requirements to be a Bank On Yourself Authorized Advisor. So, whether you’re on the side of the line that Dan Proskauer is on, and you want to strengthen your financial position and have predictability and peace of mind… or you want to be on that side of the line, chances are excellent that Bank On Yourself can help! 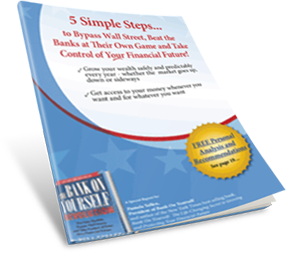 Why not find out today, if you haven’t already started to Bank On Yourself? Hey — great article, Pamela! 🙂 Wish I’d had some more flattering pictures to send, but most of the Croatia ones turned out kind of goofy…. Thanks for letting me tell my story — speaking at the seminar last summer was definitely one of the highlights of my year! 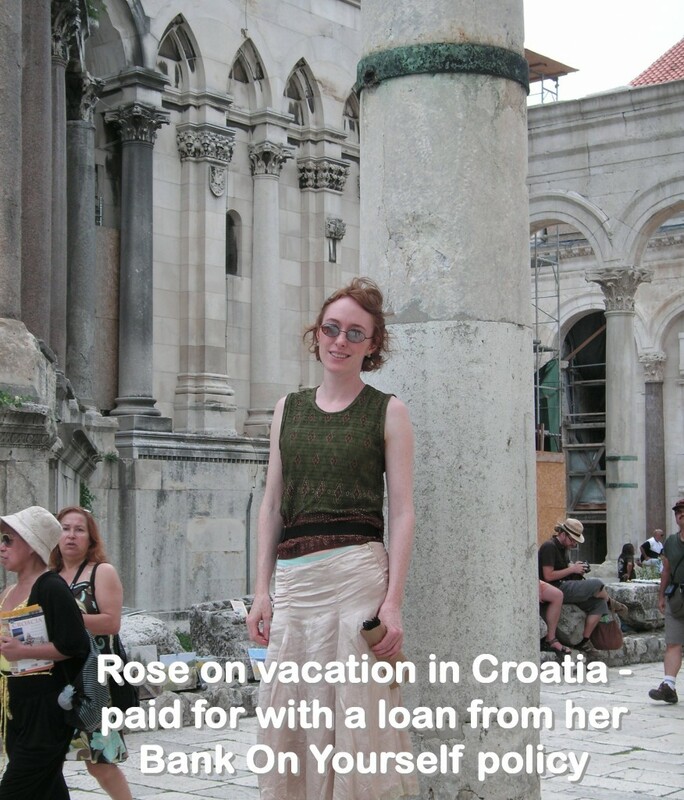 Thanks so much for sharing your compelling story – love the Croatia pic!